The following includes exerpts from "The Making of a Music Academy"
A piece of Miami music legacy lives on as members of Miami string faculty perform on Monday, March 6 at 7:30 p.m. at the Oxford Community Arts Center. 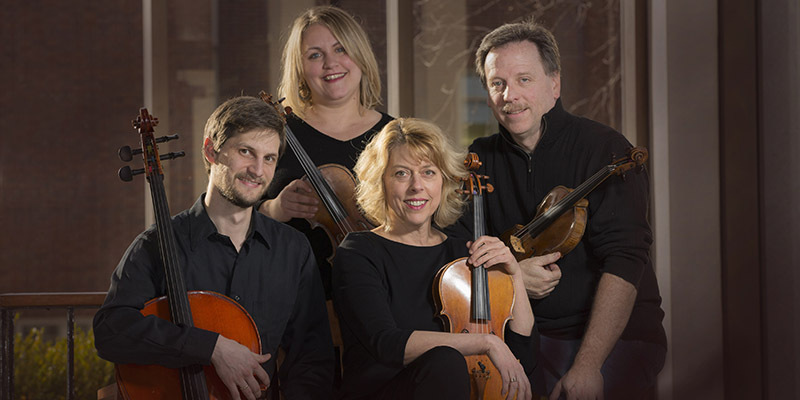 The newly re-formed Oxford String Quartet with members Harvey Thurmer and Amy Kiradjief, violins; Mary E.M. Harris, viola; and Cole Tutino, cello; will perform with pianist Frank Huang as part of the Oxford Chamber Series. Admission is free. The series represents a special collaboration by Miami University Department of Music, the Performing Arts Series, and the Oxford Community Arts Center. For the past several years, the collaboration has brought a number of professional chamber music groups to the Oxford community. This concert marks a very special occasion as members of the Oxford String Quartet come together in name since the group disbanded in 2006. The chosen repertoire for the concert includes Mozart's String quartet in E flat Major KV 428, Kevin Puts "Credo" for string quartet. Puts is a living American composer, a Pulitzer Prize winner for his opera 'Silent Night." The final piece on the program will be the Dvorak Piano Quintet in A major, accompanied by assistant professor of piano at Miami, Frank Huang. "Tonight's concert is a new beginning," said Harvey Thurmer. "It is our hope that there will be sufficient interest in the continuation of a string quartet at Miami that funding will continue to support this venture. Some of the best music ever written by any composer was written for this group of four string instruments. Each of the OSQ members has spent a great deal of our adult lives studying and performing this music. It brings us as musicians together in very unique ways, and continues to teach us as we teach our students." "It is our hope that the Oxford String Quartet will live again to bring great music to our students and community. We thank you for your interest and support," said Thurmer. It was Sutherland, a newly appointed dean in 1946, who had the remarkable vision to make one of his first and most significant acts the creation of a quartet-in-residence at Miami University. This was long before the concept of a resident university chamber ensemble was widely understood or appreciated, and Dean Sutherland had to work hard to win the support of skeptical colleagues. In fact, in the registry of Chamber Music America, only two American ensembles have so far reached their sixtieth anniversaries, both this year: The Julliard String Quartet and the Oxford String Quartet. The ensemble formed at Miami University in 1946 was named the Miami University String Quartet. The founding members of that group were Elizabeth Lane and Lloyd Outland, violinists; Anita Marcus, violist; and Elizabeth Potteiger, cellist. In 1948, Joseph Bein became the quartet’s violist, and in 1953, Adon Foster joined as second violinist. From 1950-53, the second violinist was Everett Nelson, who was also serving as Director of the Department of Music-education. The name of the ensemble was changed to the Oxford String Quartet in 1952. The quartet’s stated mission was “to bring fine chamber music to students in the University and to make a continuing contribution to the musical life of the region which the University serves.” Very quickly, their contribution proved to be much greater than anyone could have anticipated. An intensive performance schedule in the region began to identify Miami University as a place for serious music studies, particularly in the area of string education, and helped to attract a greater number of talented students to the school. The Oxford Quartet became the University’s music representatives on concert series in Ohio, Michigan, Indiana, Kentucky, and Illinois; and it presented on-campus workshops and educational concerts in public schools all over Ohio. Many concerts included joint performances with various members of the Music Department and other invited guests. At the time there were five university quartets (Miami being one) in the country. Besides the quartet at Miami, the other resident quartets in the nation were at Northwestern University, University of Illinois, Indiana University, and the University of Michigan. Sutherland established exchange concerts for these groups to perform concerts at their various institutions. There would be a quartet performance almost every month during the academic year. "We played in every grade school and high school in Ohio. Sutherland published a brochure about the quartet, which was taken to the schools. We were invited to play on the Miami radio station, WMUB, which was then located in Williams Hall next to Krieger Hall. There was no studio then, so the woman in charge of the project had wires strung from Williams Hall to Bishop Hall, where the quartet played for their first radio broadcast." Elizabeth recalled that the original quartet was in place for almost thirty years from 1946 until 1975. In 1972, Dr. Everett Nelson was Chair of the Department. Elizabeth remembers being called into his office one day to hear sad news. Nelson told her that one of the most difficult things he had ever had to do was to break the news that the University would no longer subsidize the Oxford String Quartet. The very last concert given by the original Quartet members was in 1975, including on the program the Mozart Piano Quartet in G Minor, with Louise Erickson, pianist. During the 1980s, Miami University and its Department of Music decided to re-activate the Oxford String Quartet. The string faculty involved in the new Quartet were Harold Byers and Kiki Bussell, violinists, Marna Street, violist, and Steven Shumway, cellist. Over the next decade, the personnel of the Quartet changed, with the exception of Steven Shumway who remained the guiding force of the Quartet until his untimely death in 2000. Violist Mary Harris joined the faculty in 1988 and continued as violist with the Quartet through its final year. With the arrival of violinist Harvey Thurmer in 1997, the Quartet enjoyed a period of critical acclaim extending to the international arena. Notable were a series of compact disc recordings and international tours. In addition to tours of Europe and Asia between 1999 and 2005, they performed with pianists Sandra Rivers, Michal Chertok, Anton Nel, and Lydia Brown playing trios and piano quartets. Also during those years, the Quartet mentored other quartets from the Soviet Union and South America. The members of those quartets have gone on to perform in professional appointments. 2006 marked the 60th anniversary year of the Oxford String quartet. The Quartet invited violinist Hall Grossman to return and perform in a gala concert where former members of the quartet were honored, including Liz Lane, Adon Foster, Marna Street, Harold Byers and Steve Shumway posthumously: all of whom were at the concert at the Oxford Community Arts Center. The final performance of the group took place in 2006 at the Echternach Festival in Luxemburg.